It took around a month, but my Commando has finally finished Chapter 1 of his class story. Level wise, I am 32 which is what the final quest wanted. Overall, I enjoyed the first story quite a bit. I also felt that the final fight was pretty satisfying. My companion, M1-4X, died and I was left with only a couple hundred hit points. For my Legacy, I chose 'The Werit Legacy'.' Crazy, I know. I am very interested to see what else they have planned for that system. Now on to the temptation. 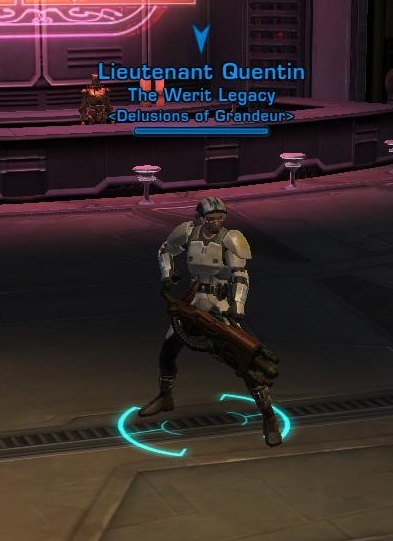 My original plan was to play the Trooper until 50, then roll an alt. However, now I'm wondering if I should start that alt right now. The main motivator for this is crew skills. If I start an alt now, his crew skills can support Quentin here in a relatively short amount of time. If I wait until 50, they won't be useful anytime soon. Then I start wondering if I should roll an Imperial Agent, which looks awesome. He would be of no help Crew Skill wise to my Commando, but it'd be a different leveling up experience. On the other hand, a Smuggler looks pretty cool too. The downside is that I would revisit areas I just got through.